Cyril Harris was a prop forward who played for Gloucester from 1935 to 1939. He played for Gloucestershire throughout their County Championship winning season of 1936-37. In January 1939 his career was cut short when he broke his leg playing at Leicester. Cyril John Harris was born in Gloucester on 3 January 1910. He made his first team debut at Llanelli on 9 March 1935 at the age of 25 but quickly established himself and was a fixture in the front row during his short career. 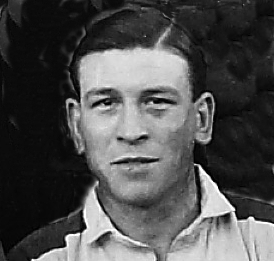 Cyril Harris was described by Mervyn Hughes, who played alongside him and later became club president, as “an outstanding prop….solid as a rock”. However he also had pace. A few weeks after making his debut he played at wing forward against Harlequins and the following month he appeared alongside four internationals representing Gloucester in the Middlesex Sevens. At the start of the 1935-36 season, after only a handful of first team games, he was considered to be “a county player in the making” and made his debut for Gloucestershire against Somerset on November 19. He played for Gloucester in almost every match that season, including victories over Cardiff and Llanelli and played wing threequarter against Headingley, turning in what the Citizen described as “a very creditable performance indeed”. The Citizen, reviewing the season said “The Gloucester front row [Tom Price, Bumps Carpenter and Cyril Harris] were equal to any opposition they met”. In 1936-37 Cyril Harris played in every match for Gloucestershire, in a season in which they won the Championship, beating East Midlands at Bristol in the final. He again played for Gloucester in almost every game, as he did in the following 1937-38 season. Cyril Harris died in Gloucester in April 1985. Many thanks for your correction, Dan. As you see, I have amended the article. I am one of Cyril’s grandsons and a 25 year Glos follower. It was actually at Kingsholm 14th Jan 1939 against Leicester that he broke his leg. Not at Welford Road. Cyril was my father. He was unassuming and never boasted about his rugby career but was very proud to have played for both Gloucester and Gloucestershire. My brother Don who played for Gloucester United has his velvet county cap and I used to have his county shirt but it got stolen, unfortunately. We perhaps didn’t realise his potential.